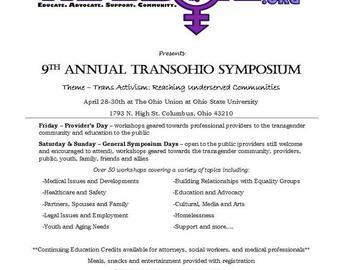 The Symposium is held each year in Columbus Ohio and is open to providers to the transgender and gender variant community as well as transgender and gender fluid individuals and our allies, families and friends. The Symposium provides three days of workshops and programs geared towards this communty and allies. The event is being held aon the campus of Ohio State University May 13-15, 2016. The slected host hotel for the Symposium is the Varsity Inn- OSU South.